26 years ago - Hartley Rathaway is born deaf, the son of publishing magnate Osgood Rathaway. 21 years ago - 5-year-old Hartley is given experimental audio implants which allow him to hear, beginning a lifelong obsession with sound and technology. 13 years ago - 13-year-old Hartley develops the technology to manipulate sound and produce various hypnotic effects. He rebels from his father to become Pied Piper, antoginizing the Flash & Kid Flash. 12 years ago - 14-year-old Hartley joins the Rogues. 11 years ago - 15-year-old Hartley befriends Wally West when the Rogues team with the Flash to battle Gorilla Grodd. 9 years ago - 17-year-old Hartley attends the funeral for Barry Allen, & comforts Wally West. He decides to quit the Rogues, and to begin going to school to become a social worker. 7 years ago - 19-year-old Hartley comes out as gay and reconnects with his father. 6 years ago - 20-year-old Hartley's first symphony is played by the Keystone Symphony Orchestra. He comes out publicly as a former Rogue. ​4 years ago - ​22-year-old Hartley is a groomsman in Wally West's wedding. ​Pied Piper was actually a pretty early take on Flash's traditional gimmick villains; DC tends to take any and every story out there and turn them into characters one way or another, so honestly it would be weird if there WASN'T a character based on this old slice of German folklore. What makes him interesting, however, is what they did with him later on. There were plenty of takes on the idea of Flash villains reforming and becoming allies, but Hartley was one of the first, and he wound up being an interesting addition to the larger story because of it. Pied Piper first appeared in 1959, one of the early creations of John Broome & Carmine Infantino. Because most of his existance was happening in the 60's and 70's, his general asthetic was decidedly of that era. I'm sure the sucess of that sort of thing varies from reader to reader; I have no problem accepting comic characters with a very 90's vibe, so I have to assume that some readers have no problem with very 60's designs. Still, it always seems pretty funny to me. In any case, after the 1985 Crisis of Infinite Earths brough about the death of Barry Allen and the introduction of former Kid Flash Wally West as the new Flash, Pied Piper was one of the very first Rogues to be reformed. Hartley was now a noted champion of the poor and downtroden. It's also very worth pointing out that Hartley was, if i'm not mistaken, one of the earliest sucessful depictions of a homosexual character in comics. It wasn't part of his early characterizations, obviously. Attempts at depicting gay characters didn't land very well for a long time, leaning a bit too heavily on stereotypes, but Hartley had more going on in his live as a reformed villain. The fact that he was gay was actually the SECOND most interesting thing about him, and that made him seem more human than most gay comic characters at the time. Hartley is a pretty cool character if we use him right, but that has more to do with his place in the world than in anything he brings as a comic book bad guy. 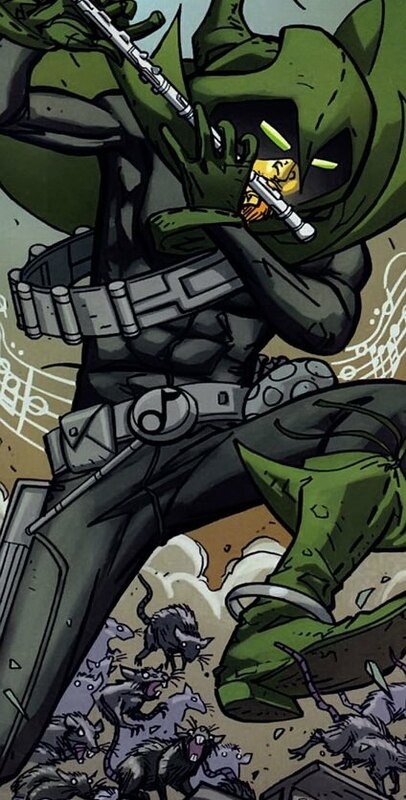 His powers are definitely different; it's kind of cool that the guy does his thing by playing an instrument rather than punching or shooting something, but it's not the most visually dynamic set of powers. What we decided to really lean on is the fact that he's very much a friend of Wally West. 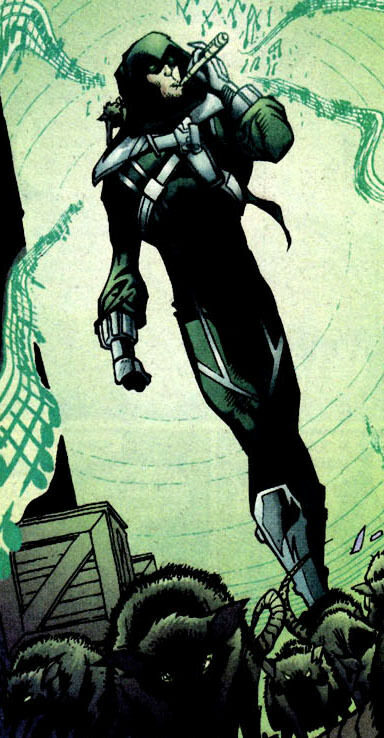 by making him the exact same age as Wally, he can make his career as a rogue something that happened while Wally was Kid Flash (which is actually pretty accurate to his depictions in comics, he's just usually depicted as an adult duting that time.) This means that the Rogues actually took in a teenage kid, but later stories had them taking in Alex Walker, so there's already precident for it. We used the death of Barry Allen, a huge moment of transition for Wally West, to also serve as a defining moment for Hartley. His adult life gets to be defined more by who he is as a person, not by his costumed identity... and to that end we created the notion of his career as a composer. Obviously, he's not DONE being the Pied Piper, there are totally opportunites for him to put on his costume to help his friend Wally, but that doesn't have to be the most interesting thing about him anymore.